If you feel your marriage is beyond repair, it’s best to consult with a family law attorney sooner rather than later. Going through a divorce can be emotionally and mentally taxing and it can be difficult to know where to turn for proper legal counsel. Before rushing out to hire just any divorce attorney, you should ask yourself how you want the divorce to be handled. Did you and your partner mutually agree on the divorce? Is it one-sided? If your marriage isn’t completely entangled with children or finances, you could look into hiring a mediator or attorney to help negotiate the terms of your divorce. Friends and family can provide great insight on legal counsel. Talk to someone you know who has dealt with a divorce attorney and inquire about their experience. Although it may be difficult and sometimes embarrassing asking for referrals in this department, keep in mind that a divorce is one of the most important business and personal transactions you may ever make. If you have children it’s important to consider choosing a family law professional to work with throughout the divorce process. Working with a family divorce attorney will ensure the interests and needs of you and your children come first. Your attorney should also be able to refer you to experts in family counseling and other specialty family services. Throughout the divorce process it’s important to keep the ultimate goal in mind: the divorce. Don’t let your emotions run wild when it comes to negotiating material possessions with your ex-spouse. Arguing over minuscule things will only make the divorce longer and more litigious. While the process of finding the right divorce attorney can be daunting, take advantage of the free consultations that many law firms provide. During these sessions be sure to bring a list of key questions such as how many years of experience they have and what kind of clients they have experience with. Always remember that it is better to be over informed than under informed! Our family law attorneys understand the trials a tribulations of facing a divorce or custody battle, which is why we tailor our legal strategies to meet your distinct needs. 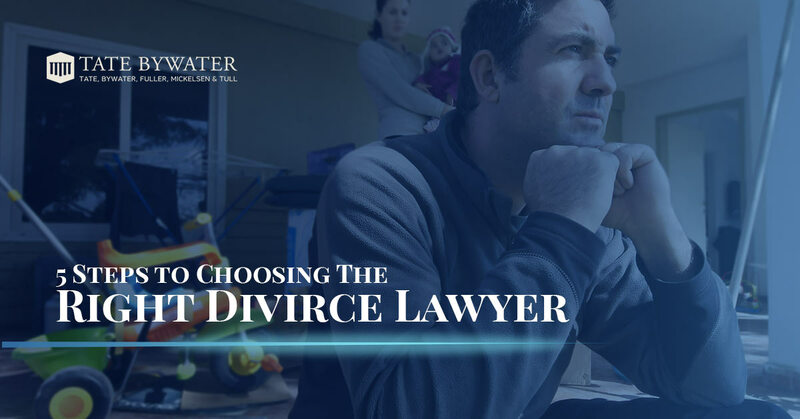 For more information on our family law services in Virginia and Maryland, reach out to TATE BYWATER divorce attorneys today.